I thought this was a great report that aired April 20th. Click here for a summary of the video on Wycliffe’s blog. 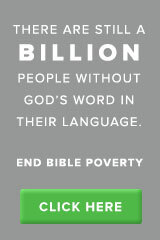 This entry was posted in Wycliffe and tagged Bible Translation, Last Languages, Wycliffe. Bookmark the permalink.